Many cultures have their own unique recipes for bread. This Puerto Rican water bread (pan de agua) is similar to French or Italian bread because it's made from the same basic ingredients, but the baking process is different. The dough is placed in a cold oven and is set above a pan of boiling water. 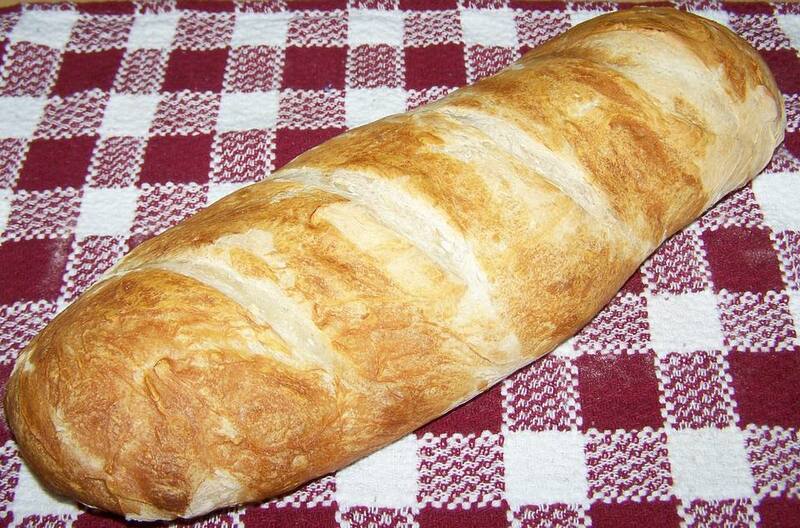 The bread continues to rise as the oven heats, causing the crust to become deliciously thin and crisp. Mix together the yeast, sugar, and 2 cups warm water in a large mixing bowl. Cover the mixture and let it stand for about 20 minutes until the yeast forms a foam on the top. In a separate mixing bowl, mix together the salt and flour. Add the flour mixture to the yeast mixture 1 cup at a time. The dough will begin to form as you add the flour. Knead the dough for 10 to 15 minutes after you've added the last of the flour. It should become elastic and no longer sticky. Grease a large bowl and place the ball of kneaded dough inside. Cover the bowl and let the dough rise for 1 1/2 to 2 hours. The dough should double in size. Flour a work area and place the risen dough on it. Separate the dough into 2 equal portions and knead them into separate long loaves, about 12 to 14 inches. Sprinkle some cornmeal or flour on a baking board or cookie sheet large enough to hold both loaves. Place the loaves on the board or sheet and make 3 to 4 slashes along the top of each with a sharp knife. Mix together the egg whites and the 2 tablespoons water. Brush the egg mixture on top of the loaves. Place the loaves on the center rack of a cold oven, then place a shallow baking pan on the rack below the loaves. Fill the shallow pan with 1 cup boiling water. Wait 10 minutes, then turn the oven to 400 F. Bake the loaves for 35 minutes. Their internal temperature should reach 200 F and they should be golden and a little crusty. Serve warm. Cornmeal works better for dusting the baking board or cookie sheet, but flour will do in a pinch. This bread is made without fat so it's best enjoyed the day it's baked—it will get stale rather quickly. If you want to save the second loaf until the next day, cover it as securely as possible so it won't dry out, then re-warm it in the microwave for a few seconds. You can use the bread to make Cuban sandwiches or use leftovers to make bread pudding.